John Steinbeck’s classic novel, “The Grapes of Wrath,” depicts the plight of a people who were deceived and exploited, used to create an atmosphere favoring the rich and powerful and a credible analogy can be drawn between those times and a situation that exists today. In the early 1930s, the continuous windstorms in Oklahoma blew away the topsoil on what had once been arable, productive land and they became barren fields unfit for farming, creating a massive exodus of people to California, where the fruit growers had put out the word that there was plentiful work for good wages. Actually, there was ample work but the caravans of jalopies loaded with people and possessions headed for “the promised land” had the desired effect and exponentially inflated the labor force reducing the wages the growers had to pay to have their fruit harvested to pennies, making the fruit growers richer, but reducing families of migrants to existing any way they could, living hand to mouth, constantly on the edge of starvation. It was a deplorable situation, a true example of greed, of choosing exceptional profit over the welfare of mankind, an intentional flooding of the labor market that forced desperate people to work for a pittance, and if they weren’t willing to work for what the growers offered there were plenty of destitute people who were. Does anybody think that Gavin Newsome is declaring California a sanctuary state out of the compassion in his heart for migrants, the same heart that doesn’t give a second thought to the murder of thousands of unborn babies in his state every year? People, please stop and seriously think about this, all Pelosi, Schumer, Newsome et al. are interested in is an unbeatable democrat voter base and giving their major contributors and influential supporters who run major businesses an inflated labor pool to keep the costs low and the profits high. I ask you, what is the difference in these people and the greedy California fruit growers of the thirties who attracted thousands more workers than they could possibly employ, just so they could profit, causing human suffering on a grand scale. Well, they’re all dead and gone now, and what good did it do them? The Democratic leaders, state and federal feign compassion and charity, but these people are one-eyed jacks and if you could see the hidden side of their faces you would see much fewer noble purposes, selfish reasons, the lust for power, control over the lives of other people and he the accursed dark political ambitions that haunt the professional politician. While the old guard and their compatriots try to force their intentions on America, the party they champion is in the process of dumping the likes of Pelosi and Schumer as the young guns of socialism have become the new media darlings, getting most of the favorable sound bites and interviews, a situation of their own making, that is rapidly slipping out of their control as the progressive wing of the party all try to out-promise each other. So - though it will take a while - the old guard’s days are numbered and if - God forbid - the situation they are trying to create ever happens, it will benefit the “new” Democrats, not the undertaker types like Chuck Schumer or the Flub-A-Dub personalities of the Nancy Pelosis but the new fresh-faced radicals who will promise the moon and deliver misery. Either way, the faces may change but the political ends don’t. Buckle up patriots, it’s going to be a rough ride. There is more to this than just greed, although that's what starts the ball rolling. Once the money is secure, it's power and control that they need to fill their lustful souls. These people have never "earned" a dime. Every cent they have came from someone else's paycheck. We will likely fall much deeper before we climb back out of this hole. Pray for a speedy recovery. God Bless. I agree Charlie. Thank you for your posts! God has blessed you greatly thru music talent and yet you seek God’s name to be lifted up over that. That is a man after God’s heart. As always, you hit the nail on the head. I really don't understand how liberals can support these fools and in pretty much the same breath, curse conservatives. Mercy the things that have been said to & about me because I support President Trump, As recently as this week! These same people support fools like Pelosi & Mad Max! It boggles the mind. I agree Charlie. The young ones all want it easy and free. Nancy doesn’t care about the illegals. A reporter showed up at Nancy’s house with some illegals 2 weeks ago and she slammed the door in their faces and called the cops. But that didn’t make any headlines. We all would hate to see the real colors. Thank you for your daily and weekly inspiration. I have never thought about this other side of the coin, besides another devoted enabled Democrat voter!!!! 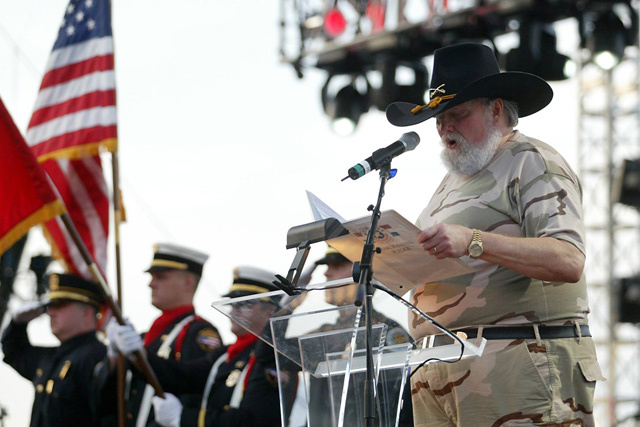 Charlie Daniels, I wish that you would consider running for Alexander's seat this time around. You would win and you would be great. Very well said. (As usual). Once again, you hit the nail on it's head Charlie, and gave the one-eyed Jack's a black eye! Socialism is the dream of the new Democrats and the old lying eyes of Pelosi and Schumer have brought it about. It is scarey this world the our children are growing up in! The silent majority needs to stand their ground and be ready for anything. Those on the left need to dig into history and look with their eyes and see Venezuela and the other Euopean and Scandinavian countries barely hanging on to their messed up govts. Wishing you good health and keep on fighting the good fight. I need to get you back on the show- just let me know when you're ready! It's Charlie Daniels all the way at the WWB! God bless! I had learned about the dust bowl era in school but somehow missed the informationyou about the fruit growers. Thank you for this important history lesson. The devil is in the White House. Really Charlie? You mention the Dems but never the pumpkin on Pennsylvania Avenue that caused this or are you gonna be like the othet MAGA minions and blame everything on Obama? This is a beautiful letter. I was moved and would love to copy this for my friends on Facebook to see. Or I can just give them the Web-site & let them read others of Mr. Daniels letters! Love him! And thank you, Charlie for being a true American Patriot! Socialism is NOT the goal.